It is important to maintain bone density even at an older age when there is higher chances of minor falls, fractures, joint pain and sprains. Also as we age the body’s capacity to absorb calcium decreases and the bone mass decreases. Hence a minimum of 1000 mg of calcium is a must after the age of 60 for the bones to be able to support our body. 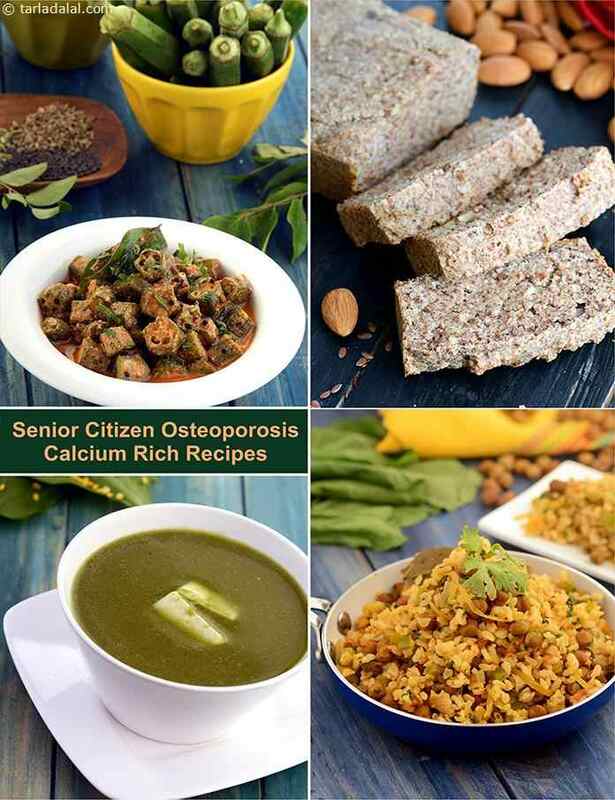 Grace your pantry with these calcium laden foods…. Dairy products like milk, curds, cheese, paneer and buttermilk. Pulses like moong, moath beans, chana, rajma etc. Sprouted pulses are a better source of calcium as sprouting increases the calcium content. Nuts and oilseeds like almonds, walnuts, peanuts, sesame seeds (til) etc. Green leafy vegetables like spinach, amaranth. colocassia, fenugreek etc. and other vegetables like broccoli. Deep-fried foods as they hinder with the absorption of calcium. Refined foods like maida, pasta, sugar etc. as they lose calcium in their process of refining. Chocolate and cocoa as they are rich in oxalate which hinder with the absorption of calcium. Aerated drinks as they contain citric and phosphoric acid which decrease the absorption of calcium. Don’t forget to include these recipes in your diet along with an appropriate dose of exercise under your doctors or trainers guidance to keep your bones healthy.